I took this shot when I was in Raikhad, India! So many cotton candy! I want one! Here is my creepy post for today. Happy WW! Nice! I like the contrast... the cotton candies look pretty. It looks a bit like some of the flowers we enjoy seeing on WW. So much cotton candy, so little time. Looks yummy yet overwhelming! Happy WW! cotton candy? love ko yan! That's a nice candy man, lol ! My daughter says you can never have too much fairy-floss. It's a gorgeous photo. I love the bright colours. The colors in this shot are amazing!!! I honor the legacy of Ted Kennedy on my WW meme this week. I wish I'd taken that picture. It's striking. That looks like one huge cantyfloss lollipop! LOL! Nice shot! hmmm that's yummy. kids will surely love that. is this pic taken in india? ahhhh yeah really india! Cool picture. The color of the cotton candy is such a great contrast to the rest of the picture. Happy WW! Mouthwatering shot! Great color & contrast! Nice shot! 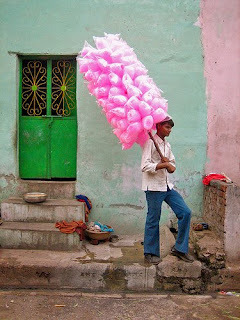 I love cotton candies. Mine is up now. Hit me back if you can. It would have made a great entry for Photohunt's theme of last Saturday! Great picture Mariposa! What a wonderful photo, the colors, the composition! What a fabulous picture, Mariposa! I love cotton candy... so light and fluffy and SWEET! I hope you get a chance to check out my WW post for today! I hope you’re feeling better today! I enjoyed learning about Word-Filled Wednesday (a new one to me) and love the Candy Man photo for WW today. It would have made a perfect entry for last Saturday’s Photo Scavenger Hunt! Today I've shared things I've learned in the 3rd session of my beginning Photoshop Elements class ... at SacredRuminations and Small Reflections ... so I hope you'll drop by to see. I'm hungry now, LOL... GREAT picture! Nice shot! I kept thinking what a mess if a bird flew into it! Thanks for your visit. The bird in my WW is a Turkey Vulture of all things. Very nice photograph, good composition. I love cotton candy! i love this picture...i find it really funny. it suddenly reminded me of my childhood days. thanks for dropping by mine. Hey! Can I pls have those cotton candies! lol! Reminded me of my childhood days! Oh that looks like a bellyache waiting to happen!